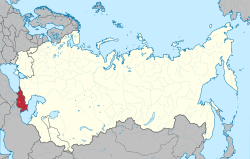 The Transcaucasian Socialist Federative Soviet Republic (Transcaucasian SFSR or TSFSR), also known as the Transcaucasian Soviet Federative Socialist Republic, was a constituent republic of the Soviet Union that existed from 1922 to 1936. It embraced Armenia, Azerbaijan and Georgia. As they were separated from Russia by the Caucasus Mountains, they were known traditionally as the Transcaucasian Republics. Created ostensibly to consolidate the economic situation of the region, the TSFSR was also useful in consolidating Bolshevik control over the states. It was one of the four republics to sign the treaty establishing the Soviet Union in 1922. The roots of a Transcaucasian condominium state trace back to the dissolution of the Russian Empire in 1918, following the October Revolution, when the provinces of the Caucasus seceded and formed their own state called the Transcaucasian Federation. 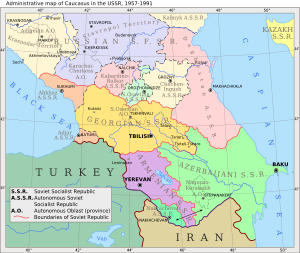 Competing ethno-national interests and confrontation with the Ottoman Empire in World War I led to the dissolution of the Transcaucasian Federation only two months later, in April 1918. The three successor states: the First Republic of Armenia, the Democratic Republic of Azerbaijan, and the Democratic Republic of Georgia, lasted until the end of the Russian Civil War that was being fought across the mountains, when they were invaded by the Red Army and sovietized. Following the proposal by Vladimir Lenin the three now Soviet Republics, the Armenian, Azerbaijani and Georgian SSRs, were united into the Federative Union of Socialist Soviet Republics of Transcaucasia on March 12, 1922. In the same year, on December 13, the First Transcaucasian Congress of Soviets transformed this federation of states into a unified federal state and renamed it into the Transcaucasian Socialist Federative Soviet Republic, though keeping formally the autonomy of its constituent republics. The congress also adopted the constitution, appointed the Central Executive Committee (the highest legislative body), and the Council of People's Commissars (the government). Mamia Orakhelashvili, a Georgian Bolshevik leader, became the first chairman of the Transcaucasian SFSR Council of People's Commissars. Tbilisi was the capital of the republic. The republic became a founding member of the Soviet Union on December 30 along with the Russian SFSR, the Ukrainian SSR, and the Byelorussian SSR. In December 1936, the Transcaucasian SFSR was dissolved and divided again among the Georgian, Armenian and Azerbaijani SSRs. After the Red Army invasion of Georgia, Abkhazia, hitherto an autonomous province within the Democratic Republic of Georgia, was declared a Soviet Republic, the SSR of Abkhazia, in March 1921 by the Abkhaz Revolutionary committee. However the republic's relations with Georgia and Russia were not formally settled. On December 16, 1921, Abkhazia signed a treaty of alliance with the Georgian SSR, which defined its status as a treaty republic (Russian: договорная республика) and established a military, political and financial union between the two Soviet republics, subordinating the SSR of Abkhazia to the Georgian SSR. Thus, through Georgia, Abkhazia joined the TSFSR and was initially on an equal footing with the other republics of the federation. On February 19, 1931, Abkhazia's republican status was downgraded to that of an Autonomous Soviet Socialist Republic within the Georgian SSR. The Adjar ASSR was established on July 16, 1921 within the Georgian SSR as a consequence of the Treaty of Kars. The treaty marking the end of the Caucasus Campaign in World War I provided for the division of the former Batum Oblast of the Kutais Governorate of the Russian Empire between Georgia and Turkey. According to the agreement the northern half with significant Georgian Muslim population would become part of the Soviet Georgia but granted autonomy. Another autonomous republic was established in July 1920 in Nakhchivan, an area bordering Armenia, Turkey and Iran, which was claimed by Armenians and Azerbaijanis. After the occupation of the region by the Red Army, the Nakhchivan Autonomous Soviet Socialist Republic was declared with "close ties" to the Azerbaijani SSR. The Treaty of Moscow and the Treaty of Kars affirmed the establishment of the autonomous republic as part of the Soviet Azerbaijan. Before 1923, Georgia, Armenia, and Azerbaijan issued each its own postage stamps. The Transcaucasian Federation began issuing its own stamps on September 15, 1923, and superseded the separate republics' issues on October 1. The first issues consisted of some of the stamps of Russia and Armenia overprinted with a star containing the five-letter acronym of the Federation inside the points. Massive inflation having set in, this was followed by an issue of the Federation's own designs, four values of a view of oil fields, and four with a montage of Soviet symbols over mountains and oil derricks, values ranging from 40,000 to 500,000 rubles. The 40,000 rubles and 75,000 rubles were then surcharged to 700,000 rubles. On October 24, the stamps were re-issued with values from 1 to 18 gold kopecks. Starting in 1924, the Federation used stamps of the Soviet Union. Most of the stamps of the Federation are not especially rare today, with 1998 prices in the US$1–2 range, although the overprints on Armenian stamps range up to US$200. As might be expected from a short period of usage, used stamps are less common than unused and covers are not often seen. ^ https://web.archive.org/web/20171214163509/http://www.stampworldhistory.com:80/country-profiles-2/asia/transcaucasia-%D0%B7%D0%B0%D0%BA%D0%B0%D0%B2%D0%BA%D0%B0%D0%B7%D1%8C%D0%B5/ Retrieved 12 August 2018. This page was last edited on 17 March 2019, at 21:43 (UTC).